The Cultural Heritage Protection Cooperation Office of the Asia-Pacific Cultural Centre for UNESCO (ACCU) in Nara City organized the “Cultural Heritage Workshop 2018 (Fiji)” from October 22nd to 27th, 2018 in Fiji. 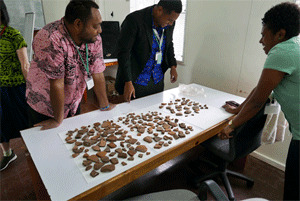 The workshop was co-organized by ACCU, the Fiji Museum, and the Agency for Cultural Affairs with an aim to teach the trainees to record specific items, such as archaeological items and ethnic materials, stored in the museum. 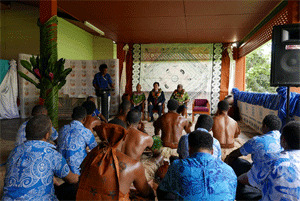 The workshop attracted twelve Fijian people involved in museums in addition to one participant from the Kingdom of Tonga, Fiji’s neighboring country. Mr. Tomo ISHIMURA, the Head of the Audio-Visual Documentation Section of the Department of Intangible Cultural Heritage, gave lectures in the first half of the workshop, i.e., October 22nd to October 24th. First, the trainees classified and organized the earthenware unearthed from actual archaeological sites according to their patterns and parts (rims, bodies, etc.). Following this, they recorded notes in a ledger in order to document these earthenware pieces. Then, they gathered characteristic relics from the classified ones to prepare rubbed copies and measured drawings (sectional views) of the relics. Next, they prepared measured drawings of the unfragmented earthenware with replicas for practice. Finally, they prepared and organized cards based on the rubbed copies and measured drawings. The advantage of the on-site workshop was that it provided a concise understanding of technological transfer in a more practical manner by actually allowing the participants to work with local materials. However, the disadvantage was in the planning of the workshop which was more suitable for the local materials, the features being different according to each site. For example, in Fiji, it is rare for an archaeologist to unearth an unfragmented piece of earthenware from the site. In many cases, the earthenware is discovered in small pieces. The focal point of the archaeological workshop organized by ACCU in Japan was the practice of measuring unfragmented earthenware whereas in this workshop in Fiji, a lot of time was spent in the classification and organization of earthenware pieces and recordings of their rubbed copies in accordance with the local conditions. Many trainees attending this unique workshop were interested in the topic since they had practically handled materials in diverse manners without systematic processes to classify, organize, and record the materials. We would be honored if this workshop contributed to the conservation of cultural properties in this region.